The first Chassidic girls’ school in the world, Beth Rivkah was created in 1941 as a flagship institution, pioneering the Lubavitch Educational System for girls, by Rabbi Joseph I. Schneersohn OBM, Sixth Lubavitcher Rebbe, and led by the Lubavitcher Rebbe, Rabbi Menachem M. Schneerson OBM. A total of over 2000 students, ranging from preschool children through post-high school graduate program students, attend the school each year. In the aftermath of the Holocaust, with the Jewish people languishing in a state of despair, the institution assumed vital importance in its role of educating and inspiring the next generation of Jewish women to counteract the tide of assimilation spreading through the United States. The school ultimately became an anchor in the Rebbe’s historic efforts to dispatch energetic emissaries who, armed with their top-quality Jewish education, love for their fellow Jew, and Jewish pride, are thank G‑d continuing to achieve great success in their ongoing effort to illuminate and transform the Jewish landscape worldwide. Beth Rivkah is unique in that, after its inception, it never had to recruit students. Unlike the student bodies of most yeshiva girls’ schools, Beth Rivkah girls come from a kaleidoscopic variety of backgrounds: from those whose ancestors were Chabad Chassidim to those whose grandparents were raised as secular Jews in middle America; from the children of Sefardi or Ashkenazi Israelis to the children of Iranian or Russian refugees; from the children of South American Jews to the children of Western European Jews; and, in a small number of cases, from the children of converts to children of color. It’s the backgrounds that differ, not the girls. All are welcome at Beth Rivkah, and all are united by their commitment to Torah. Through the study of Torah and our precious Jewish history and heritage, Beth Rivkah students develop and strengthen their identities as Jews and their connection to the global Jewish community. Jewish Law and Chassidic ways and traditions guide our curriculum and daily schedule and provide the foundation for each child’s bright future as a strong, productive female Jewish leader. Our students learn that upon them rests the responsibility to positively influence those around them. These young girls are trained and prepared to meet the tremendous challenge of directing Jewish educational centers across the world. 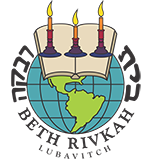 Since its inception, Beth Rivkah has been at the forefront of Jewish education in the United States and beyond. In the wake of its establishment, a number of other Chassidic girls’ schools were founded, as well. Furthermore, as Beth Rivkah graduates have entered the community-at-large in sizable numbers as educators and resource people, the blueprint and content of the Beth Rivkah curriculum has spread to untold thousands of other educational institutions across the Jewish spectrum. This is not to mention the cumulative personal impact of Beth Rivkah graduates upon those they meet, which is incalculable. The effect of the education provided to a single Beth Rivkah student reverberates literally throughout the world.